PERIDOT (intense green, centre bead) - WISDOM & ABUNDANCE Prevent negative influence & great in attracting abundance & good for heart. It has a strong detoxifying effect. Cherry quartz is a healer for emotional wounds and can help with anger & tension. Excellent for concentration. 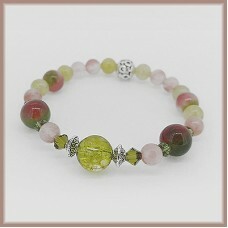 Promotes inner wisdom & courage. 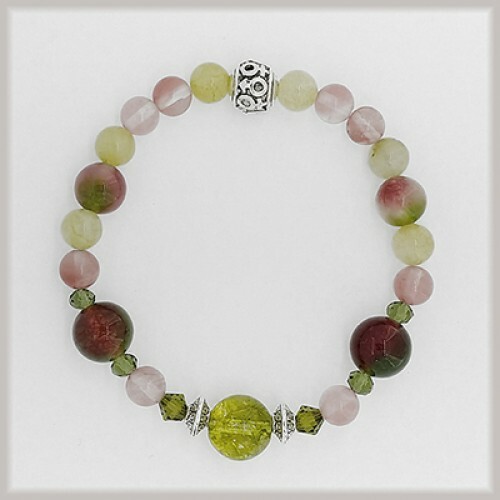 Protects against negative effects of electromagnetic radiation & inharmonious energies.